The "Hydro Wave Bearing" fan spins at 2450 RPM and operates on, as you probably guessed, ball bearings. That and the multi-leveled air duct surrounding the fan blades make for a very quiet unit. The only sound I heard radiating from my case were the 3 other case fans. The base of the copper heatsink is was you would expect. The face of the base has sanding scratches all across its surface, but none of these were very deep grooves and performance most likely isn't affected by them. The included thermal compound gets rid of the problem entirely by filling in these grooves. 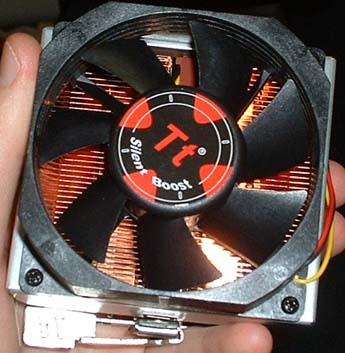 As you can see above, Thermaltake decided to advertise their URL www.thermaltake.com on the base as well as the side of the heatsink. 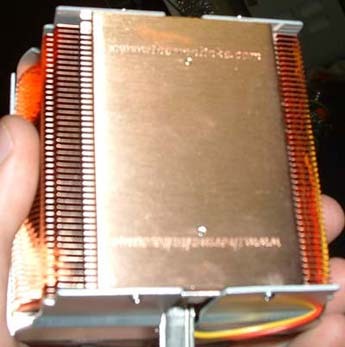 There are a total of 46 fins copper fins attached to the base of the heatsink. This is 20 less than Thermaltake's Volcano 12, and seems to be a step backwards since the more fins a heatsink has the better it dissipates heat. Installation of the Silent Boost K8 was a very pleasant experience. After removing the stock AMD Athlon 64 heatsink from the processor, I applied some OCZ Thermal compound. Then I put the heatsink in place, engaged the clip onto the retention frame and flipped the lever. Piece of cake. This new style of screwdriver-free heatsink is much better than older heatsinks. There is no longer a worry about slipping and jamming the screwdriver into the PCB of the motherboard, or worse yet the circuitry. Another worry was that the heatsink may not fit because on the FIC K8 motherboard there is a line of capacitors along the left side of the CPU, but the Silent Boost K8 is the same size as the stock AMD cooler so there was no conflict with space.